In Darth Vader #23, the Dark Lord of the Sith builds a door. He opens that door, and then he’s distracted by attacking Mustafarians. But while he turns his attention, Momin reveals his true intentions. A Sith will be a Sith after all. The issue opens with Vader trying to open the door to the other side. It fails. Apparently Momin doesn’t quite have the design right, and it takes them a few tries before they get there. 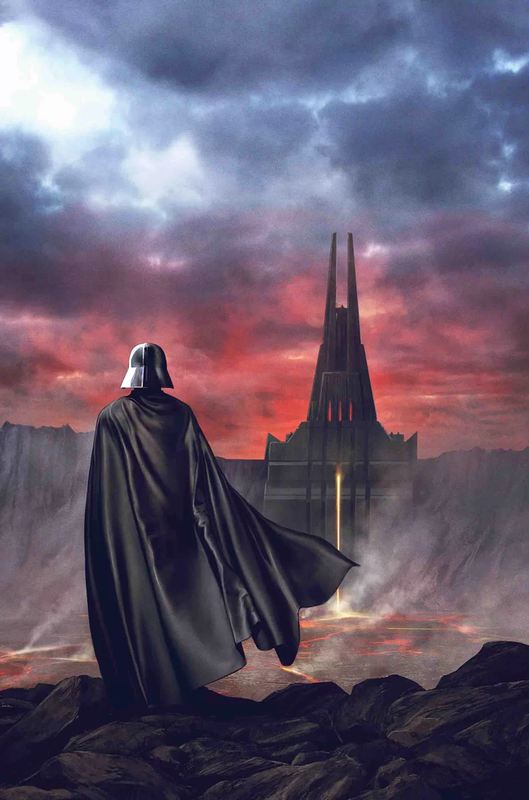 Eventually they wind up with the final design for Vader’s castle, and Vader is able to open the door. But the attacking Mustafarians draw him away before he can go through the door. During his distraction, Momin opens the door and brings himself through. His living self. Much like Star Wars Rebels saved Ahsoka from dying, Momin is able to save himself via the door. Now Vader is going to have to deal with Momin and the Mustafarians. It’s certainly getting interesting. The artwork does a great job of complementing the story. There’s gorgeous colors with all the fire. There’s nice attention to detail, and some of the panels just catch your eye and hold your attention. The story is great. The dialog is witty, fun, and on point. The relationship between Vader and Momin provides for some humor as he keeps trying and failing to get the design right, and Vader keeps killing Momin’s bodies. It’s just the right amount of dark humor and foreboding darkness. After all, they’re trying to create a door to another reality. With that power, there’s no telling what Darth Vader could do. With a top notch story and good artwork, this issue earns a five out of five metal bikinis. There’s only a couple issues left, but it’s keeping the interest high.